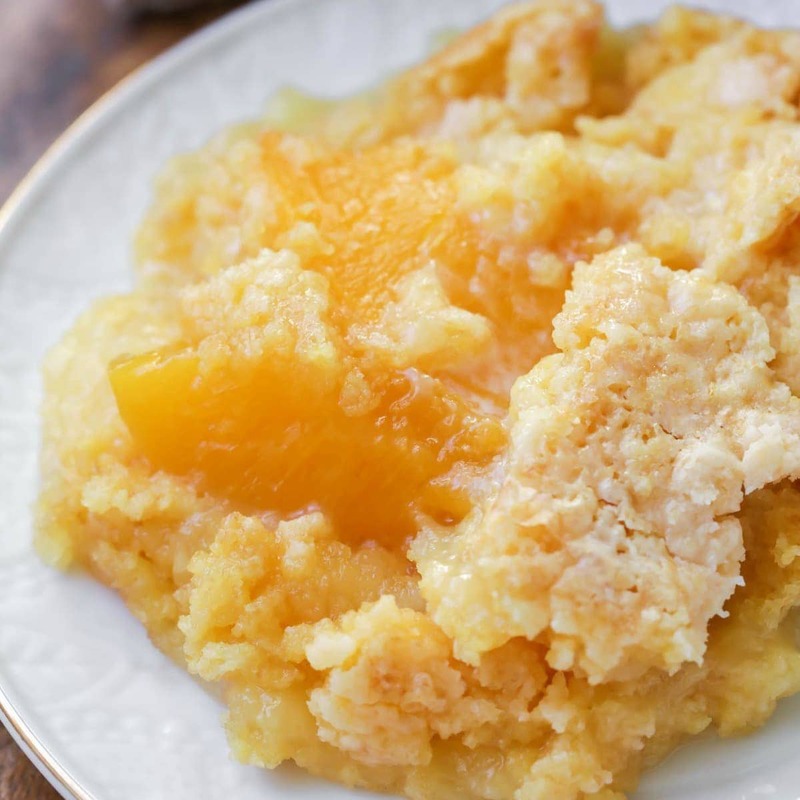 Quick, simple and tasty Peach Dump Cake is always a hit. This cake mix based treat is filled with peaches and butter and is the perfect dessert to make when you don’t have much time to prep but want a warm, delicious cake. Have you ever had dump cake before?? It reminds me so much of a cobbler of sorts, but it’s become one of my favorite go-to types of desserts. Dump cakes are usually made with a base of cake mix plus some sort of fruit filling and are usually dumped into a pan, stirred and baked. I first tried it when my aunt gave me an amazing recipe for Pumpkin Dump Cake that quickly become a fall favorite and led us to make a Cherry Dump cake recipe and today’s Peach Dump Cake. We love peach treats in our home (and especially Peach Cobbler) so we knew this would be a hit and it was! 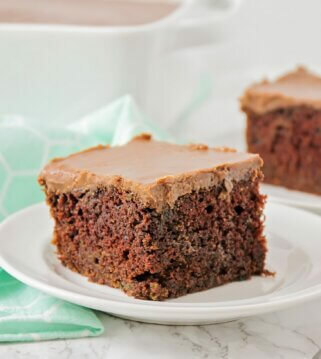 Make this cake by preheating the oven to 350. Then spread peaches, with the liquid into a greased 9×13 dish. Sprinkle the cake mix evenly over the peaches. 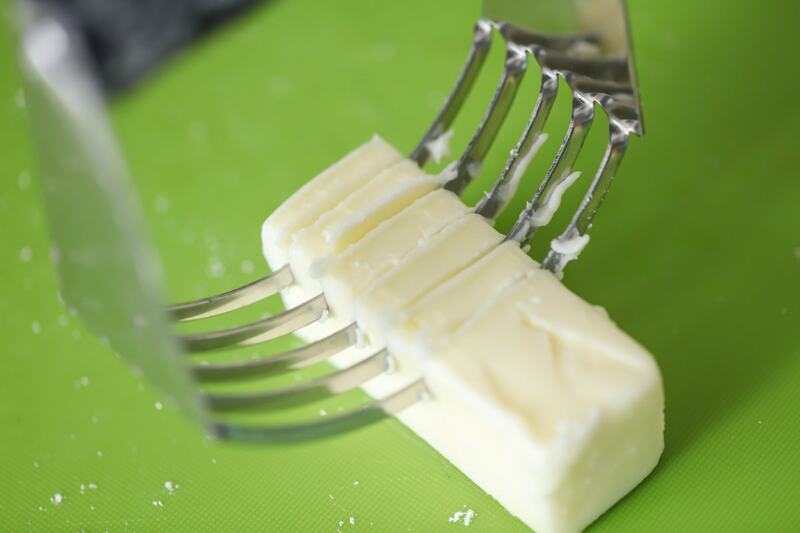 We like to cut the butter using a pastry blender. Makes it simple and quick! 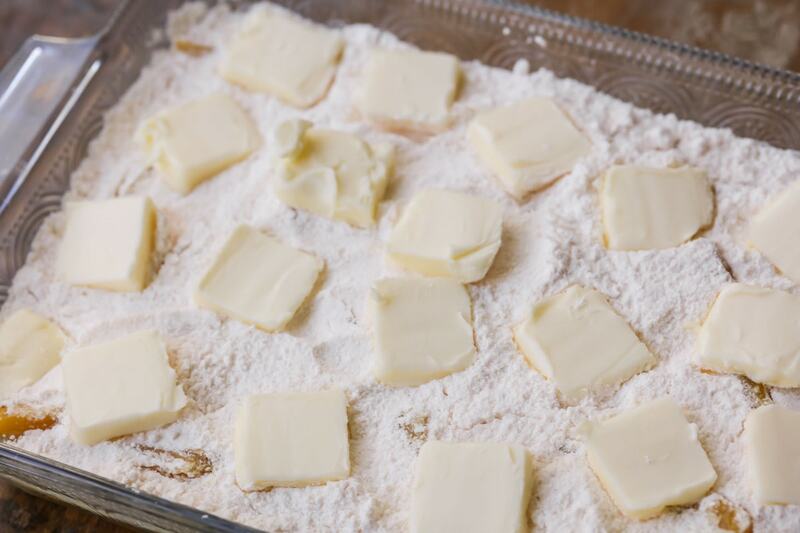 Place the butter evenly over the cake mix and bake for 40-45 minutes. 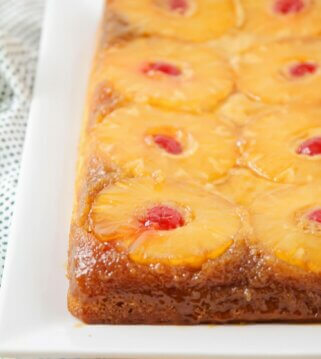 Serve warm on it’s own or with ice cream, and you won’t believe how tasty this cake is. You can also serve this whipped cream, but however you serve it, we think you’ll love it! Just used the canned fruits for this and the instructions will be the same. How to make dump cake in crock pot? This recipe can also be made in a crock pot! Just dump the peaches and syrup in the bottom of a greased slow cooker. Then melt your butter and mix it with your cake mix. Sprinkle over the peaches making sure to break up any large pieces. Cook on HIGH for 2 hours or LOW for 4 hours. How to store Dump cake? Place in an air-tight container in the fridge for up to 3-4 days. Reheat in the microwave if wanting to enjoy warm. 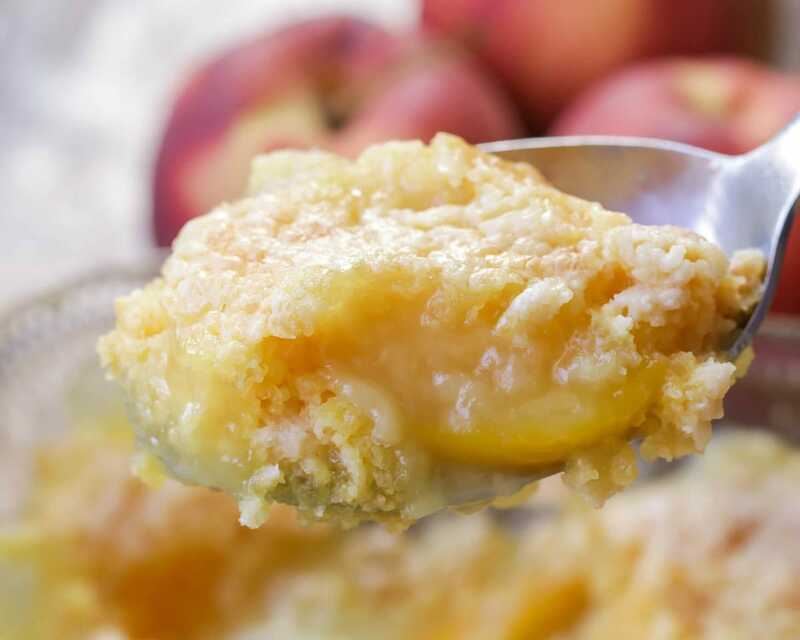 Quick, simple and tasty Peach Dump Cake is always a hit. This cake mix based treat is filled with peaches and butter and is the perfect dessert to make when you don't have much time to prep but want a warm, delicious cake. Spread peaches, with liquid, into a 9x13 baking dish. Sprinkle cake mix evenly over peaches. Place butter evenly over cake mix. Bake for 40 - 45 minutes, until golden and bubbly. Serve warm or at room temperature. Just love this recipe with peaches!! I have been making it for decades but with apples, which my family just adores to this day. Will definitely try your recipe!! Thanks very much! Love recipes and crafts. Can’t wait to see more of your blog. Thank you so much for letting me know! I am glad you liked it! Trying this peach dump cake for the first time. I hope my family likes it. I’ll keep you posted. Thanks Lil Luna! So fast and easy ???? That is why I love it!! Thank you! My grandma lived with us for a while before she passed away, and would always make dump cakes for dessert! I was feeling nostalgic, and decided to make this peach dump cake recipe, and it did not disappoint! For how simple the ingredients are, this cake tasted amazing. Oh, I am so glad to hear. I am sorry about your grandma 🙂 Thank you for letting me know! This peach dump cake was the best!! It was incredibly easy & so flavorful!! My husband loves peaches & thought this was the best dessert ever! I’m a sucker for warm fruity desserts like pies and cobblers. It’s currently peach season and I wanted to try a new recipe with them. My family loved this recipe. I cant wait to make it again when the weather cools down. Was surpRised how good this turned out and so easy! Great recipe! I am so glad you thought so 🙂 We love this! Thank you for letting me know! Truly a simple and delicious dessert that takes no effort. The canned peaches make it even faster to put together. We like to serve it with ice cream. Yum! I made mine with Apples, BROWN Sugar Cinnamon and Raisins as my filling. It came out so delicious! Thanks for the Dump Cake Recipe…my now favorite! Especially now that Fall is here. A great holiday dessert! That sounds perfect!! Thank you for letting me know! I’ll have to try! 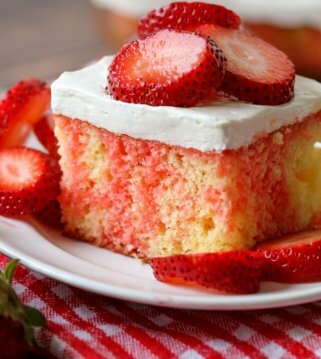 this cake is full of flavor! 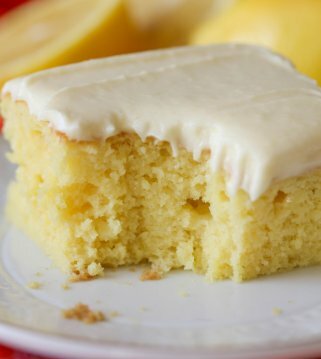 this is definitely one of my family’s favorite cake recipes! 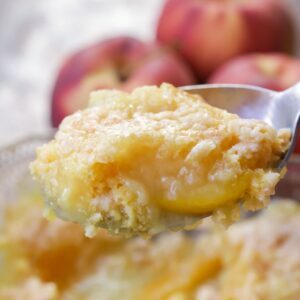 My hubby loves peach cobbler, but I’ve never been a fan of the doughy texture that a Lot OF cobblers have. I made this TONIGHT and it was AMAZING!!! 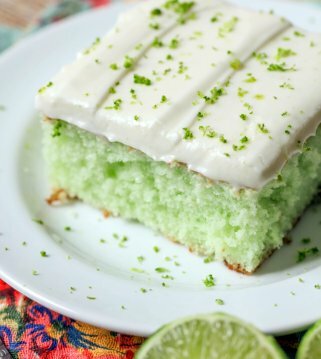 This is seriously delicious and so simple to make! We found a wonderful compromise with this dessert! Thanks so much for sharing the recipe. Omgoodness, I’m speechless, sooo good. Thanksgiving dinner, Christmas dinner, new year’s day celebration, etc. it was delicious and incredibly easy. just two hints: I froze my stick of butter and the serrated knife. the butter came out grated and was easier to evenly cover the cake. i also mixed the cake mix well with the syrup so the whole dessert was moist after baking. This was the easiest recipe to make and was so Tasty! This Is excellent just as described. The first time, I just followed the recipe, and Served it warm with He A v y cream. The second time I made it, I added 1/4 tsp almond Extract and a pinch of cinnamon. I served it at room temperature with ice cream. Both Versions were hits. Both sound perfect!! Thank you for trying it! A friend introduced me to this recipe many years ago, and we love it. She called it ” Lazy Girl Delight” lol, its quick, easy and delicious! I like that name! Thanks for sharing that! Little girl! She is long gone and none of us ‘cousins’ had her recipe. Turned out perfectly! The only thing I did DIFFERENT was wHip up some whipping cream with 1/4 tsp. Vanilla EXTRACT and 1/4 tsp cinnamon. Served a dollopover cooled cake. Thank You so much. So glad you found this recipe 🙂 Thank you for trying it! I am happy you liked it!